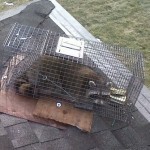 Click to Get a Raccoon Removal Quote Now! Raccoons are a familiar sight just about everywhere, because they will eat just about anything. These mammals are found in forests, marshes, prairies, and most importantly in cities. They are adaptable and use their dexterous front paws and long fingers to locate food. In the wild, raccoons look to the water to find a meal. Raccoons are nocturnal foragers; they use their incredibly quick paws to grab crayfish, frogs, and other aquatic life. On land, they feast on mice and insects and raid nests for tasty eggs. They will also eat vegetables and fruit, including what they find in peoples backyard gardens. They will even open a garbage can to get into its contents if the mood strikes. In the wild raccoons will use tree holes and dug out borrow holes to nest but the raccoons in the city often enter people’s attics for shelter and nesting. Females give birth to up to seven cubs in a litter, giving birth in early to mid spring. The young raccoons often spend the first two months staying inside the den, until the mother starts bringing them out on nightly excursions. Raccoons gorge themselves in spring and summer to store up body fat. They then spend much of the winter asleep in a den. Raccoons like to enter houses via roof vents, soffits and even chimneys. While a raccoon is in your attic it is constantly causing damage by walking over your insulation, it packs it down decreasing your insulation R-value, therefore bringing it below code. Also raccoons will defecate while nesting in an attic as well as chewing and gnawing. Raccoon feces can be highly toxic as raccoons are carriers of round worm which is passed through them through defecation, which can be passed onto humans if they come into contact with it. In most severe cases attics must have the insulation sucked out, the attic must be decontaminated and insulation must be re-blown back in. The only way to guarantee this from happening to your home is having raccoon prevention screening installed over all potential entry points on your home. Prevention work is the only line of defence against these intelligent scavengers.